Film maker and daredevil Devin Graham (aka DevinSuperTramp) just revealed his most extreme stunt yet to the world, and this one is right up my alley! Devin, his fearless film team, and a crew of 6 professional base jumpers traveled to Panama City where the high-flying jumpers zipped down from the top of a 700 foot, canal-front building before releasing themselves from 10,000 ft of zipline and landing on a Speed Stick-branded base via parachute. 3 cameras and a bunch of GoPros caught all the action, and the results are pretty epic. There’s also a behind the scenes video that shows how it all came together. Pretty wild stuff! 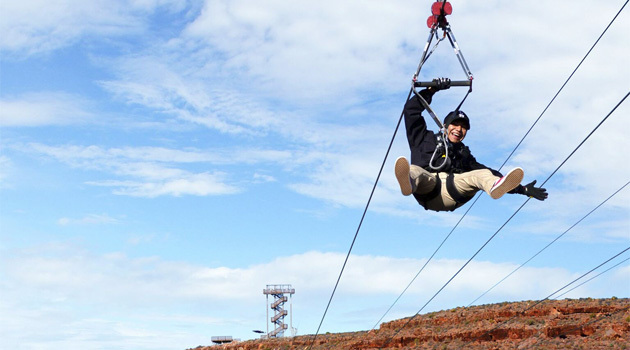 Who’s Brave Enough To Go Zip Lining Across The Grand Canyon?